Ah, day 3 of the Andervaction, but we do have more pictures to vote on! You can continue to vote on all days until Sunday. 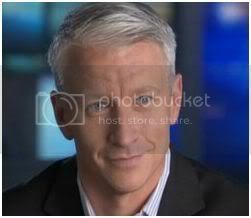 I know it isn't Anderson, it's Charlie Moore, but the picture is cute anyway! B- Handsome, but too posed and "fake". I prefer photos that keep it real, I think. No contest today. I choose A. It's just a great pic, plus the socks with the gray feet, sweet. I love pics of him working in unusual surroundings. This is the hardest one yet! They're all great. After a hard struggle, I went with D - the combo of 2 cute guys and a cute critter was too much to pass up. Oy vay....this is getting difficult. I have to agree with you m. minkoff on your points for each picture. I am going to wait to vote and see what strikes my fancy a bit later. I've already voted, but the completely adorable sleeping baby polar bear pic deserves some praise too. That is just SO cute. Ya'll are making this so very difficult cause all these PIP pics are so good! LOL! 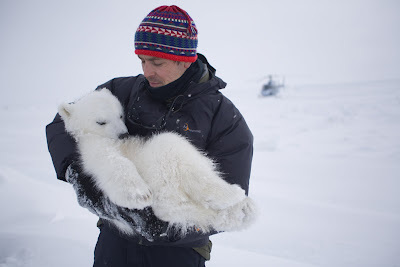 "A" is one of my very favorites of Anderson cause it is so unusual seeing him sit on suitcases to work, but I'm going with "C" cause how many people get to hold a sleeping polar bear cub out in the wild and it's a very sweet pic of Charlie holding the cub like a baby which it is. Love those pics of Anderson at top of post, PT! Creative! Hope everyone has a very safe and fun Halloween today!!!! It's is my first time to make any comment on this website. I am not good at English. I've only read them since I found this blog. Recently I've come amd read you guys' writing almost around the clock. you guys help improve my level of english and get more information about anderson.^^ Thank you so much. 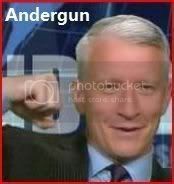 Thank you for posting anderson;s adorable pictures. it's hard to make a decision~~but I prefer A! A of course....he is so cute! Welcome Hanna! Your English is good, don't worry. I vote "A". That photo just makes me want to place my head on his shoulders and say "Watcha writing there, honey? " LOL !! I'm glad that Halloween is over with. I'm going with 'A' soo qute!